We hope you find some of the following suggestions helpful. A wide seat, shallow seat depth and no sides are ideal to accommodate most harnesses and braces (for babies and toddlers). To promote health hip positioning there should be sufficient room to allow the legs to move into their natural frog-legged positon. Frequent breaks, on longer car trips, may be needed from a comfort point of view during treatment. Extend the straps to the full length as needed but ensure the belt still fastens properly and the straps aren’t loose. A piece of foam or a small towel, folded behind the back can help if there is a gap due to the harness, brace or cast. 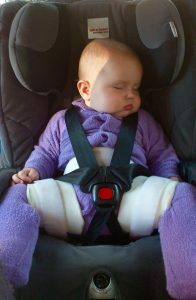 Depending on positioning, it may not be safe to secure your child using your existing car seat. Any form of modification to the carseat can impact on it's safety rating. 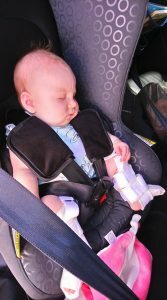 Speak to a qualified health professional about your child’s fit in their car seat. Also see Kidsafe for further car seat safety guidelines. Developed by Healthy Hips Australia July 2015. Revised December 2017.